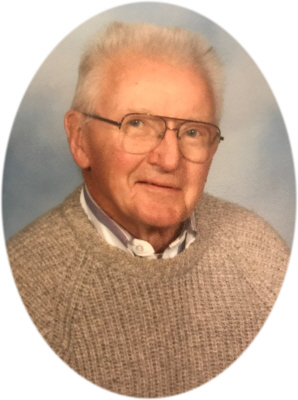 Charles C. “Jack” Wingle passed away on Sunday, October 28, 2018 at his home at the age of 95. He died peacefully in his sleep surrounded by his care givers of many years and a very special nurse, Celia Polash. A Mass of Christian Burial will be held at St. Paul Apostle Catholic Church, Ithaca, MI on Wednesday, October 31, 2018, at 11:00 A.M., with Rev. Fr. Andrzej Boroch officiating. Burial will take place at Ithaca Cemetery, Ithaca, MI. Visitation will be held on Tuesday, October 30, 2018 from 2-8 P.M. with family present from 2-4 & 6-8 P.M. with a Rosary being prayed at 7:30 P.M. at Smith Family Funeral Homes Ithaca, MI. Visitation will also be held Wednesday at the Church one hour prior to Mass. Charles was born on the family farm east of North Star on February 27, 1923 the son of Dennis James and Theresa (Cain) Wingle. He was the youngest of nine children. Jack was a graduate of Ithaca High School and resided his entire life in Gratiot County. Jack married Betty Caldwell and they were together until her passing. He then married Berneda Shaw and they were together two years, until her passing. He farmed during the day and was a night time Supervisor at the Wolverine Shoe Company until its closing. Jack was a true friend to all those in need. He will always be remembered for his generous heart, his smile and good nature. After retirement, he made his rounds every morning, visiting four different people who were shut-ins and very sickly. They lived alone, so he would see if they needed anything. Sometimes, it was a doctor's visit, food, money, needing anything repaired, etc. He was always willing to help anyone. He was a great neighbor. His winter hobby was refurbishing antique tractors, making them look like new. He refurbished one tractor every winter for 23 years. He attributed his longevity to drinking one glass of wine every day, not smoking and never taking medication. Jack was a member of St. Paul's Catholic Church. He is survived by his 2 nephews: Richard Wingle of Ashley, MI; and Michael Wingle; 3 nieces: Mary and Keith Peters of Ithaca, MI; Frances and Christopher Kimball of Redding, CT; Sandra and Edward Daggett of Eureka, MI; and 2 step-sons: Randy Shaw of Ithaca, MI; Gary Shaw of Ashley, MI. Jack is also survived by many great-nieces, great-nephews, great-great-nieces and great-great-nephews. Jack was preceded in death by is wife Betty of over 50 years, second wife Berneda, father and mother, 5 brothers: Owen, Dennis, Lawrence, Joseph, Bernard and 3 sisters: Agnes, Ellen and Clarissa. Memorials may be made to Gratiot County Commission on Aging or St. Paul Apostle Catholic Church. Online condolences can be sent to www.smithfamilyfuneralhomes.com. The family is being served by Smith Family Funeral Homes, Ithaca, MI.